(giggle) This is going to be another sinus/cold medicine post. Tuesday afternoon I got the sniffles, and Wednesday morning it was a sore throat. I put myself in quarantine - no way I wanted to bring any exotic Mexican infection into the Libraries! but it was just a common cold. I was back to work on Friday afternoon. I missed Thursday's departmental Holiday Party, too bad. This is Demetrio's cochineal pot - he just keeps adding to it. Our pots were separate, because we were playing with pH, but then he dumped the leftovers in this bigger pot. Cochineal's expensive, and it pays to keep unexhausted dye. I love the way the sunlight makes this pot just seem to glow! 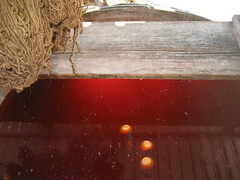 Those are limes floating, with a board over the pot for more horizontal workspace, and the yarn has been dyed with oak galls. Flickr seems to be overloaded - I can't load more than a megabyte or two without something going "BONK! your file didn't load. Try again?" That's all the sorely-overtaxed brain function has for now. I got home in one piece! No mean feat, there are a lot of steps and stairs and potholes in the sidewalks (we called 'em tourist traps), and I'm not even including the snail trek. Oh, where to begin?? Well, I should probably get to work on the pictures first, but how about a few vignettes? Getting to Demetrio's house in Teotitlan, a bed and breakfast place styled on an old Spanish villa, complete with well in the central courtyard and an open kitchen. Walking into the open kitchen and being buzzed by a bird as startled as I was. Figuring out how to access the hot water in the rather impressive bathtub/shower. Realizing that even though the restroom had four walls and a roof, those walls didn't go all the way to the roof, giving a rather brisk feeling to those late night visits. Demetrio's fantastic dye setup - with a copper pot you could use for a hot tub. That you heat with a wood fire underneath. Having Demetrio take us on a dye-gathering trip up into the mountains. Oh, how awesome... it took all day. It was in Eric's van (Eric being the owner of Traditions Mexico) so it didn't have that back-of-the-pickup-truck ambiance, but the road was unpaved and very windy. We even stopped in a mountain village to buy calla lilies from a local farmer. That was an adventure by itself - the road was so steep and narrow that the van got stuck turning around. Demetrio got out and jumped up and down on the fender and that did the trick. Driving through about a dozen different microclimates to get to a half-dozen places where we gathered oak galls, spanish moss, madrone bark, "chamomile" (not sure of the exact botanical class on that), and seeing fantastic botanical specimens of agave, trees, bromeliads, and even orchids growing in trees. Turista? Nah, not me. I'm the only one you'll ever hear of to need laxatives in order not to plug up the plumbing.